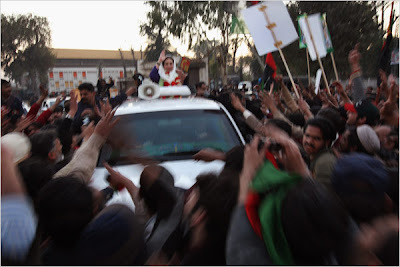 The Pakistani opposition leader Benazir Bhutto, just seconds before she was assassinated leaving an election rally near the capital, Islamabad, on Thursday. There are at times some very brave people who believe their mission in life is so important that they put themselves in immediate danger. Do you think any of her security people could have kept her inside the armored car? No, I don't think so. Ms. Bhutto's marriage to Asif Ali Zardari in 1987 was arranged by her mother, a fact that Ms. Bhutto has often said was easily explained, even for a modern, highly educated Pakistani woman. To be acceptable to the Pakistani public as a politician, she could not be a single woman, and what was the difference, she asked, between such a marriage and computer dating? So much media attention is given to how the West, ie America is leading in the Democracy of Eastern nations. Here was a woman who against enormous odds was winning this fight in her own country. Perhaps her death, as tragic as it is, will promote more independance and freedom for her people. I liked her in spite of her sometimes ethical shortcomings. Very Sad. Cheers!! Matt-man, it's hard to find a politician without ethical shortcomings... Thanks for commenting.